When Richard Ludlow was struggling in a linear algebra class at Yale, he scoured the internet for answers and stumbled upon a full video course available online from one of MIT’s mathematics professors, Gilbert Strang. He realized that there was an opportunity to create an easily accessible online platform for academic video courses and guest lectures, much like Hulu does for television content. As he did more research, he found that academic resources were grossly underutilized, as they were scattered across different sites and offered in varying file formats, making them difficult to find and browse. So Ludlow launched Academic Earth with the goal of building a user-friendly platform for educational video that would let anyone be able to freely access instruction from the scholars and guest lecturers at the leading academic universities. 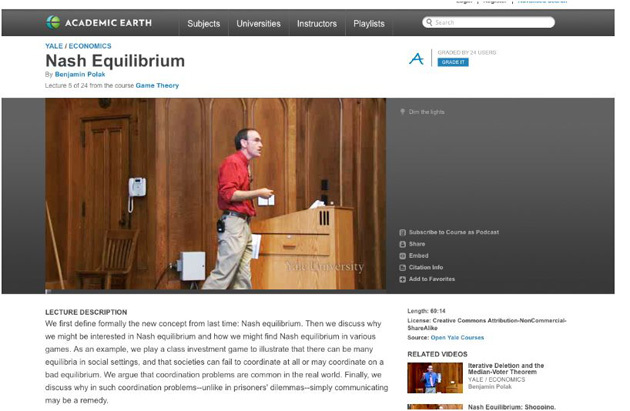 The site offers 60 full courses and 2,395 total lectures (almost 1300 hours of video) from Yale, MIT, Harvard, Stanford, UC Berkeley, and Princeton that can be browsed by subject, university, or instructor through a user-friendly interface. 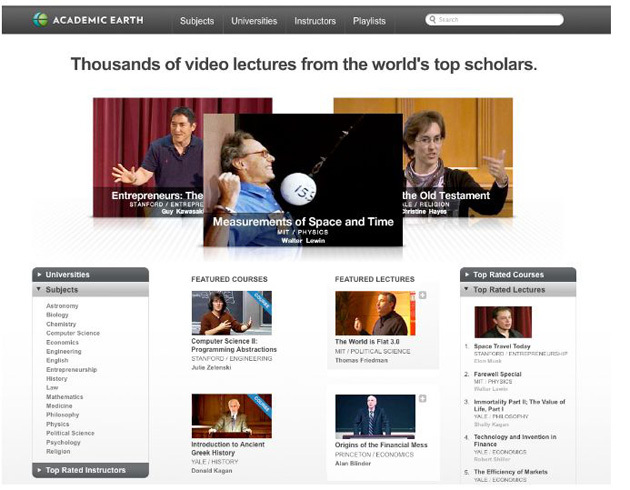 Additionally, editors have compiled lectures from different speakers into Playlists such as “Understanding the Financial Crisis” and “First Day Of Freshman Year.” The site also features a roster of famous guest lecturers on entrepreneurship and technology including Larry Page, Carol Bartz, Tim Draper, Elon Musk, and Guy Kawasaki. This isn’t a radically new idea. Fora.TV and BigThink both offer intellectual video content online. iTunes U hosts a lot of university content as well. Unlike Big Think, Academic Earth isn’t creating original content, it’s just repurposing existing academic content. And Fora.TV seems to focus more on speeches and public lectures. But Academic Earth has the right plan around providing free course lectures. You can watch an entire semester’s worth of lectures in a few days (if your brain can handle it). My one complaint is that for an academic site, it doesn’t seem to engage the user via forums, comments, social networking features, or ads. Ludlow says that all of these features and applications will be introduced slowly. The interface of Academic Earth is simple and no frills but Ludlow plans to roll out additional features, such as a YouTube-like commenting system for videos. Users will be encouraged to ask questions about the content of videos, with the hope that other users (or scholars) will answer them. Ludlow says that the site will try to make money by advertising for educational goods and services such as tutoring and continuing professional education, and will share revenue with content providers. Ludlow says universities will have the choice of opting in to commercials and advertisements. In addition to the current university sources, the site will be adding content from think tanks, conferences, and government agencies. Also, lectures can be dry and boring to watch. Academic Earth lets you download the videos, but sometimes all you want is an MP3 with the audio so you can listen in the car or on a run.